Texas Republican John Cornyn, who in 2007 said disgraced Bush administration Attorney General Alberto Gonzales was “another casualty of the hyper-partisan atmosphere in Washington,” angrily demanded that Obama AG Eric Holder resign during his testimony before the Senate Judiciary Committee today. “It is more with sorrow than regret and anger that I would say that you leave me no alternative, than to join those who call upon you to resign your office,” said Cornyn, who was one of 21 Republicans to vote against Holder’s confirmation in 2009. He cited the government’s failed “Fast and Furious” gunwalking operation and Holder’s resistance to appointing a special prosecutor to look into the recent leaks of classified national security information, among other gripes. 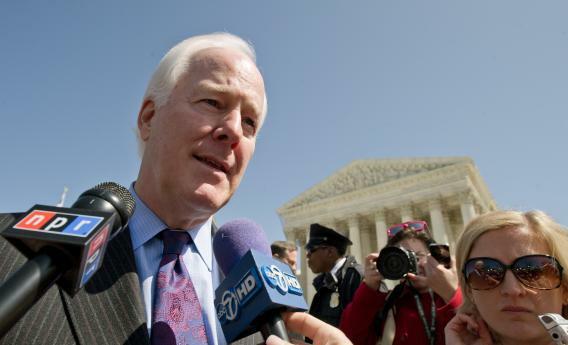 Cornyn later told reporters he had planned on calling for the AG’s resignation before the hearing began. Perhaps this gave him a guilty conscience, which would explain why he told Holder they could have a nice chat afterward to work out the details if he liked. “I’m happy to have a conversation with you about what the facts show but I would stand on the record,” Cornyn said.